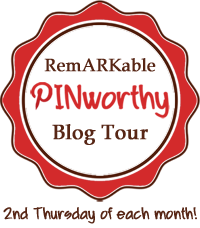 Welcome to the May edition of the RemARKable blog tour! It’s National Scrapbooking month and that’s our topic for the tour. I’m a little embarrassed to admit that I’ve only completed one scrapbook – ever – and it was intended to be Volume I of 2 to document a two-part family vacation. While I love photos – and have boxes, bags and stacks of them – I struggle with putting them together. To say I’m thrilled would be an understatement! I love the journaling cards, I love the embellishments, I love the colors, and I love the stamps! (I know, that’s a lotta lovin’). This went together REALLY quickly. The card on the right is straight out of the box, matted and stuck into the opening. The red word bubble and the little red heart are from the Point and Click photopolymer stamp set. Stamps, stickers, cards…it went together in about a half an hour. SERIOUSLY. I know it’s hard to see, but these are the Project Life 12×12 photo pages. I did the happy dance when I realized I had finally found a solution for my bags, boxes and stacks! It’s been almost a year and a half since our oldest daughter was married. These photos will slip out of the frame and right into Project Life pages – you have no idea how this delights me! The wedding invitations were hand-stamped – SURPRISE! – and I had a few extra inserts left over. I also had a bit of lace and some tulle from my daughter’s dress that will tuck into the pages. A few stamped images (and oh, will I miss Loving Thoughts) and this was done. What I love about the Project Life concept is that it’s so flexible. It can be anything you need it to be! The objective is to record the memories in a way that can be shared – or re-visited – to keep the emotion of the moment alive. Enjoy the rest of the tour – Audra Monk is next, but the rest of the tour is at the bottom of the post in case you want to go your own way! Thanks for stopping by. I love it Anne! It’s perfect! Thanks Kellie – I was so happy with how it turned out. A place for everyone in all those little pukas!